Building the curved back was a considerable challenge, solved by using a ‘cold-moulded’ boatbuilding technique, laminating many skin ply layer’s over a jig, so making plywood to my own shape and dimension. The back came apart from the base to gain entry into the flat, metal fins were cut and welded to round bars acting as back legs, then screwed to the under side of the base, hence joining the back to the base. The front legs, permanently fixed to the base and covered with leather upholstery, were tapered down stainless steel. The back legs were through-bolted, rounded off ends at floor level and chromed. 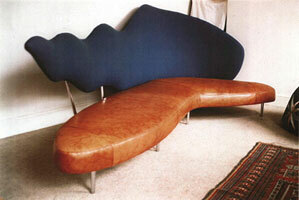 The ‘wave’ shape was cut into the ‘formed’ ply back, and then upholstered in wool.